You are here: Home / Business Models / Has the Virtual Tech Company Arrived Yet? If you go back to predictions made over the past 20 years or so, we should all be independent contractors, heavily utilizing technology to work full-time from home in temporary teams, within a virtual tech company or companies throughout the world. For the purposes of this article I am referring to both of these definitions when I talk about the virtual tech company. Workers fitting each of these definitions have the potential to offer companies increased flexibility, lower fixed costs and often higher skill levels for a given project/function at a specific point in time. Of course, in many cases a worker could fit into both of the definitions in the bulleted list above. In general, companies that are early adopters of technology tend to be those that are further down the path of virtualization, So you tend to see more virtual tech companies than non-tech companies. This makes sense, because technology itself is a very strong enabler of the ability to use the virtual model. In the old days it was much harder to be adequately connected as a non-employee, when working remotely with only a landline phone and fax machine. So industries that adopt technology faster, tend to go virtual faster as well. Old line industries that have stayed with manual methods longer tend to rely more heavily on the on-premise, full-time employee model. And of course some industries just don’t lend them themselves to heavy virtualization; it’s hard for physical retailer to virtualize most of its jobs. But it’s important to note that there are always exceptions to this type of generalization on an individual company basis. Virtualization also varies widely by function as well. As alluded to above, it’s hard to virtualize a retail clerk. On the other end of the spectrum, programmers and some call center employees can be located wherever reasonable phone service and internet connections are available. There are many, many other attributes that influence how quickly a particular industry or company proceeds down the virtualization path. Companies very concerned about security, for example, often evolve in this direction much more slowly than industries and companies where security is less of a concern. 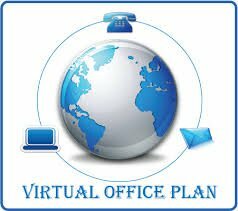 The Internet and related technologies have provided a tremendous platform for driving more rapid acceptance of the virtual work model. Since software and hardware companies tend to be early adopters of productivity enhancing technologies, it’s only natural that the virtual work model is progressing faster in tech companies than in most other industries. Even in technology companies that still rely primarily on full-time employees it’s very commonplace to work from home occasionally, or attend meetings remotely while on the road via video conferencing or online meeting software. In my consulting business, I also see with increasing frequency small or early stage software companies who are using primarily or even completely a virtual tech company business model. There’s no doubt there has been a slow march toward virtual business methods, if not a completely virtual tech company over the last decade or two. In my experience, however, most hiring managers still prefer a full-employee sitting in the office next to them over all other options. There are obviously many, many exceptions to this. But on a general basis I believe this is overwhelmingly true. People still are most comfortable with the feeling that they will be able to deal with their subordinate in person. They would rather have what they feel is the added comfort of a full-time permanent employee, whom they believe they can get to know better and believe hey can count on them more confidently over the long run. The reality is that there are trade-offs to both the new virtual and old standard on-premise, full-time employee approaches. The virtual approach offers flexibility, better matching of cost and workload and the potential for a better skill fit for a particular position or project. The on-premise employee approach is favored because of stability, known availability, cultural fit and company-specific training. In a perfect world a mix of both would be utilized and every project and position would be evaluated on an individual basis, to decide which model is a better fit for a particular situation. I do think that in many industries this will come to pass eventually. But old habits die hard and I don’t expect we’ll totally get there in my lifetime. So what do you think about how virtual the world is today — and how virtual it will become in the long run? What has been your experience? Post a comment and share your thoughts on where we’re at in this long discussed trend. Phil has once again demonstrated his cutting edge analysis of the high tech sector, coining the “virtualized” company phrase that identifies a critical trend. Whether a company has reached virtualization or not, leaders should be reading @technologyguy regularly to get Phil’s insights and business ideas. Thanks Phil. Great discussion and you really hit it allon the nose. In my experiences, in considering whether to utilize virtual employees, the stage of the product we’ve built, or are building, has been a deciding factor. When the product is new, we tend to focus internally, but when the product is mature, we tend to embrace virtual work structures. Overall, I do believe the trend is moving towards virtual, however that doesn’t necessarily mean it’s better. As for us, we believe culture and collaboration trumps skill sets.